HUNTSVILLE, Alabama — Ever seen two dudes vie for salad scraps at noon like it was the last slice of pizza at midnight? Welcome to the Apple and Blackberry Mixed Green Salad ($8), from The Bottle’s smashing, two-week-old lunch menu. As the name suggest, the salad boasts thinly sliced Pink Lady apples and fresh blackberries, with seasoned-sweet almonds and pecans, sumptuous dollops of goat cheese, very fresh mixed greens and a subtle peach vinaigrette supporting the headliners. Not sure I’ve ever described a salad as “killer” so this may be the first time. And while striking, this summery ingredient combination felt totally natural and not forced. And oh so balanced. We also gave the Crunchy Shrimp Sushi Roll ($10) appetizer a spin. Like all of our Bottle lunch items, it was attractively plated and the actual six-piece app itself tasted awesome too – pickled ginger, wasabi, crunchy shrimp and sticky soy gastrique rolled up in perfectly cooked rice for a sweet-spicy but not hot mélange. The service at the Bottle, a downtown fine-dining restaurant where the dining room boasts a masculine décor of wood paneling, oil paintings, antiqued light fixtures and the occasional Oriental rug, is polished without being pretentious. Utensils were swapped out and dishes cleared on-point. Drinks remained filled. And our meal was well paced: Appetizer and salad out in six minutes with entrees hitting the table 15 after that. For my entrée, I ordered the Pan Fried Trout ($16). The skin-up plating of trout always looks a little crazy to me, but you cannot argue with the flavor this fish possessed – snow-soft texture, flaky, hints of buttery sweetness. It started off tasting good and got better with each bite. And there were lots of bites. Generous portion. The accompanying lemon meuniere sauce – dotted with a constellation of capers – evoked earthy notes, and whenever I bit into a caper, it added an intense bright burst. The side of White Corn Cheese Grits was smooth and lux and Haricot Verts (white-table-cloth speak for green beans) achieved soft-but-crisp equilibrium. The few neon-green drops of basil oil added some sweet and leafy kicks, and I found myself searching the plate for a few more dots. We also tried The Bottles Pasta ($13). At our server Matt’s suggestion we added chicken, and man we were glad we did as the chunks of roast chicken looked and tasted like they’d just been carved, an entire hemisphere better than those creepy cubes added on at chain joints. The salad’s veggies were happening, too. Roasted tomatoes. Mushroom confit with a mycologist-dazzling selection of shrooms. Although arugula was mentioned in the menu description, we didn’t find any in our pasta. While the shell pasta was well-executed, the Parmesan Cream Sauce was pretty subdued. Also ordered the Seared Ahi Tuna Nicoise Bowl ($15), and this was one expertly curated entrée. Quite raw – warm seared exterior, cool interior – super-fresh tuna, surrounded by ingredients that all appeared to have been picked at the height of ripeness: artichokes, olives, roasted peppers and tomatoes. The grainy mustard vinaigrette added zesty accents. And you know how with many salads every bite tastes the same? Not this time. Which was really enjoyable. We felt all our dishes were worth every nickel. And there was plenty of food – for example, we split the Apple and Blackberry Mixed Green Salad three ways. The Bottle lunch menu contains just 15 items and there’s some culinary panorama there, other options include a Spicy Bottle Rocket Bay Shrimp appetizer ($15), Heirloom Tomato Fried Okra Salad ($10) and Jumbo Lump Crab Cake entree ($15). Very pescatarian friendly. An addition of some kind of sophisticated steak sandwich option might round out things nicely, as there are currently no red-meat items. 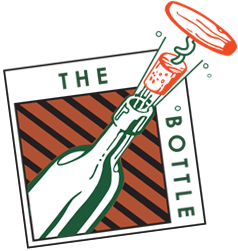 The Bottle opened last August at the corner of Washington and Franklin streets. We were pretty much floored during our 2013 review of the dinner menu. Consider this the second floor. Recommendations (lunch menu): Apple and Blackberry Mixed Green Salad, Pan Fried Trout, Seared Ahi Tuna Nicoise Bowl. Suggestions: Add chicken to The Bottle’s Pasta. Alcohol: Full bar … if you’re drinking at lunch. Service: Polished but not pretentious.